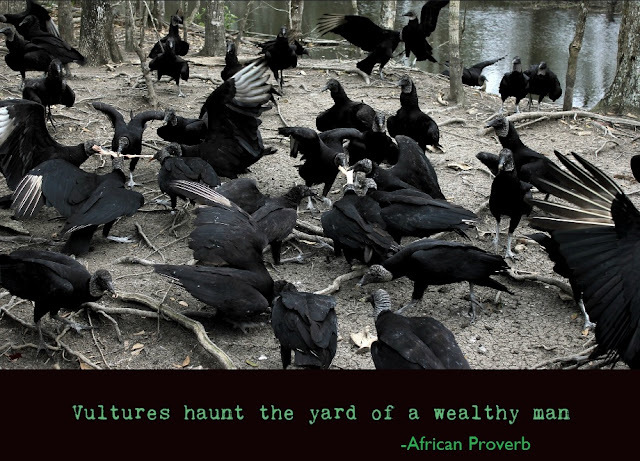 Vultures haunt the yard of a wealthy man is an African Proverb teaching us that money and wealth are always on the hunt by people looking to take advantage. It is time to change the way we talk and think about Africa. Africa is poor, it is a simple statement, repeated through millions of images, t.v., internet and newspaper stories and charity appeals each year, so that it takes on the weight of truth. We reinforce assumptions and stories about Africa that we have heard throughout our lives. We re-confirm our image of Africa. However, the truth is there is over $205 billion a US dollars leaving the continent of Africa yearly and the world is getting rich from Africa. Despite media images food is not the main imported item into Africa however, machinery and equipment tops the list. The main imported commodities of Africa are machinery and equipment, chemicals, petroleum products, scientific instruments and foodstuffs. Recent growth in economy of Africa is due to growth in soft commodities, services, and manufacturing. Africa is the world’s fastest-growing continent by population and economy and is expected to rise by an average of over 6 percent a year.